I suppose this post follows on rather nicely from our last piece about caricature prints appearing outside London. To paraphrase Dr Johnson (or at least the version of him played by Robbie Coltrane in Blackadder); if a major exhibition of eighteenth-century caricatures is as rare as a talking dog, then a major exhibition of eighteenth-century caricatures outside London is as rare as a talking dog who speaks Norwegian. That’s why I was delighted that I finally got the opportunity to visit High Spirits: The Comic Art of Thomas Rowlandson at Holyroodhouse in Edinburgh yesterday. 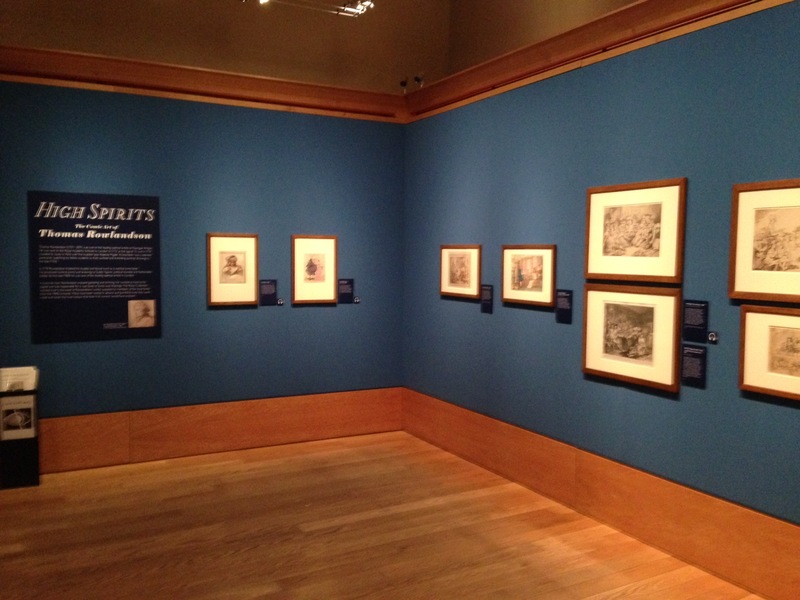 The exhibition explores Rowlandson’s life, work and world through a selection of prints, sketches, books and watercolours taken from the substantial holdings of the Royal Collection. It opens with some of the earliest surviving examples of Rowlandson’s work as a caricaturist, and leads the visitor along a thematically clustered chronology of his contribution to satirical analysis of the 1784 Westminster election, the Regency Crisis, the Mary Anne Clarke affair, and the long war against post-revolutionary France. A second smaller gallery is then used for a more cursory exploration of his parallel development as a painter and illustrator of humorous scenes, landscapes and urban topography. The first thing one notices on entering the gallery is the striking visual impact of the prints themselves. Most readers of this blog will have had some experience of handling individual eighteenth-century caricature prints but I suspect that very few of us have had the opportunity to view large numbers of these items simultaneously. The perfectly preserved state of the colouring the prints in the Royal Collection also means that they look exactly as they would have when put on display two centuries ago. 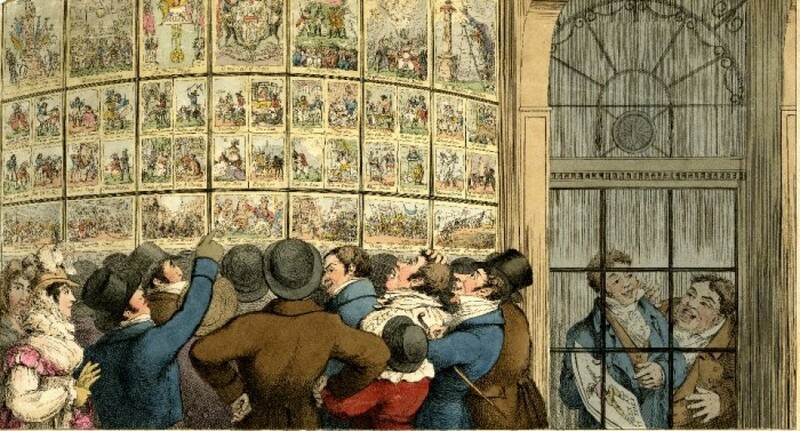 Walking up the staircase and into the gallery, one is confronted by a riot of rubicund cheeks, salmon fleshtones and rich primary colours, and it suddenly becomes obvious why printsellers shop windows were considered one of the spectacles of the drab, image-starved, world of late eighteenth-century London. I was also pleasantly surprised by the extent to which the exhibition deals with the wider issues of production, commercial exchange and consumption. We are reminded from the outset that caricature was a relatively exclusive medium targeted at a small audience of affluent metropolitan consumers. 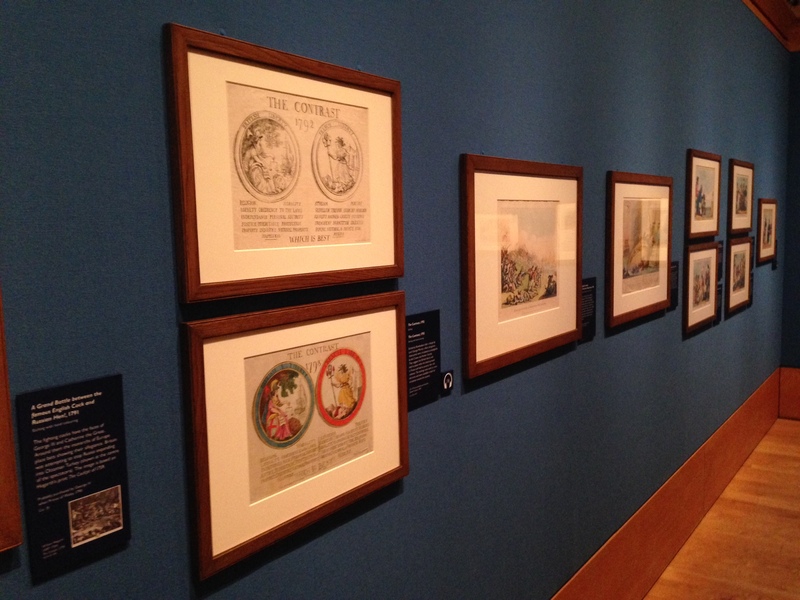 A couple of the more unusual items on display also set Rowlandson’s work against the context of a much larger trade in printed imagery. 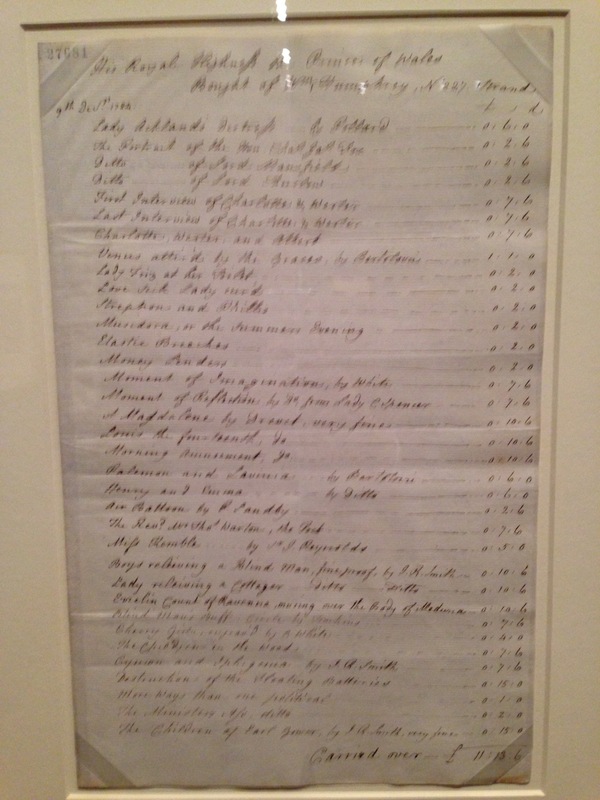 In the copy of a bill from the printseller William Humphrey for example, we see that a caricature by Rowlandson was just one item among a long list of prints the Prince purchased in December 1784 (right). 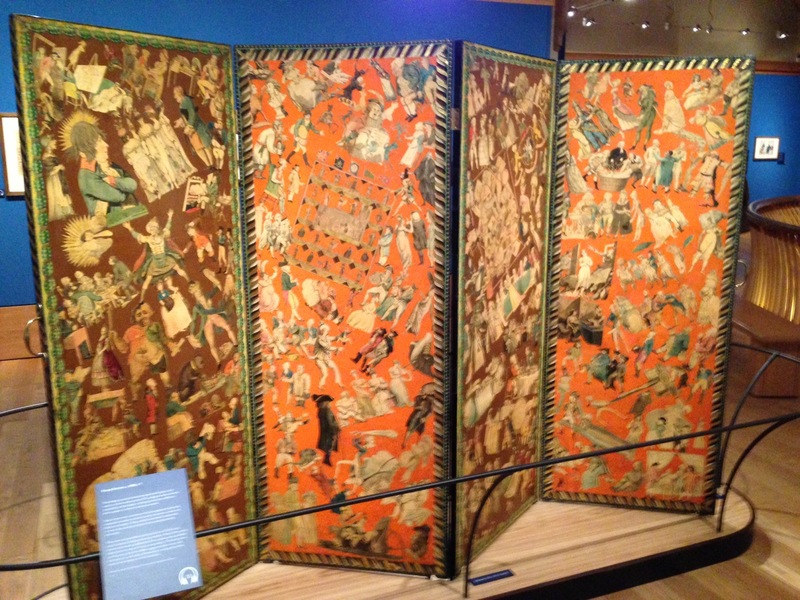 Similarly, the print-covered screen manufactured by S.W. Fores and decorated with a mixture of satirical and non-satirical images (below), suggests that caricature images were perhaps only one aspect of a contemporary fascination with the unusual and grotesque. A close examination of the screen reveals that images culled from leftover prints by Isaac Cruikshank, Richard Newton and Rowlandson, were put on display alongside pictures of native tribesmen, monsters and individuals who appear to be suffering from extreme physical deformities. Its presence therefore subtly undermines the suggestion that caricature was considered to be a culturally significant, or political influential, medium of print. High Spirits runs for another week or so and I highly recommend a visit, if only to check out the collection of Rowlandson themed fridge magnets, tea-towels and bon bons which are on sale in the gift shop! 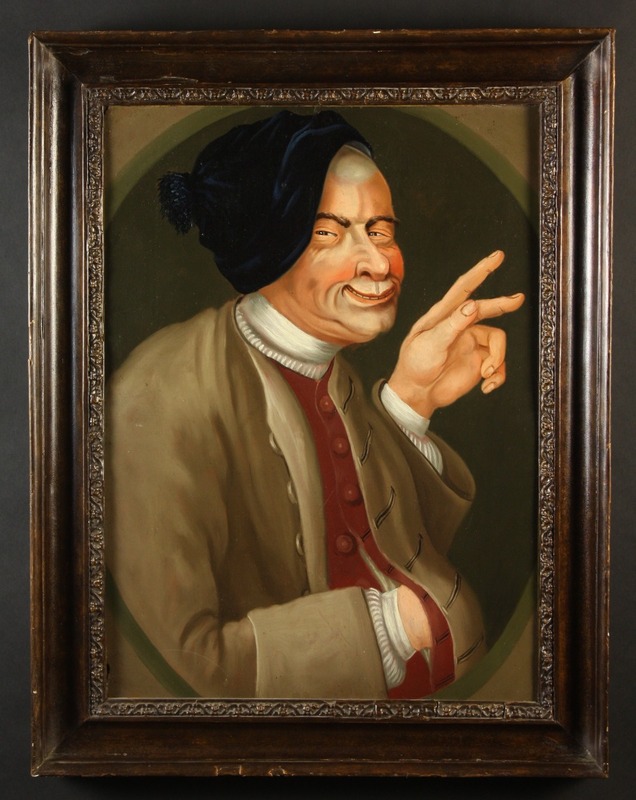 The production and sale of satirical prints outside London is a subject which we’ve touched on before here at the Print Shop Window, and it is one which was brought to mind again recently when I came across this gorgeous oil painting by the Northern caricaturist John Collier in a saleroom in South Yorkshire. Collier, who often worked under the pseudonym Tim Bobbin, was one of only a handful of provincial artists that were able to successfully carve out a career in the London-dominated world of eighteenth-century caricature. His surviving letters suggest an almost militant adherence to his Lancashire roots and an unwillingness to countenance the notion that residence in the Great Wen was a prerequisite for creative or commercial success. When one publisher tried to coax him into ‘getting on his bike’ and relocating to the metropolis, Collier replied bluntly that: “I do not like London, or anything that is in it; for it’s a place where neither me, or mine shall ever come, if I can hinder it”. It is an attitude which provides a refreshing counterpoint to the snobbery displayed in so many metropolitan satires of this period. While Londoners may have enjoyed the jokes made at the provincial’s expense in an array of prints by Gillray, Cruikshank and Rowlandson, Collier sneered right back at metropolitan smugness, ensuring that southerners were made to pay a handsome premium for his works. 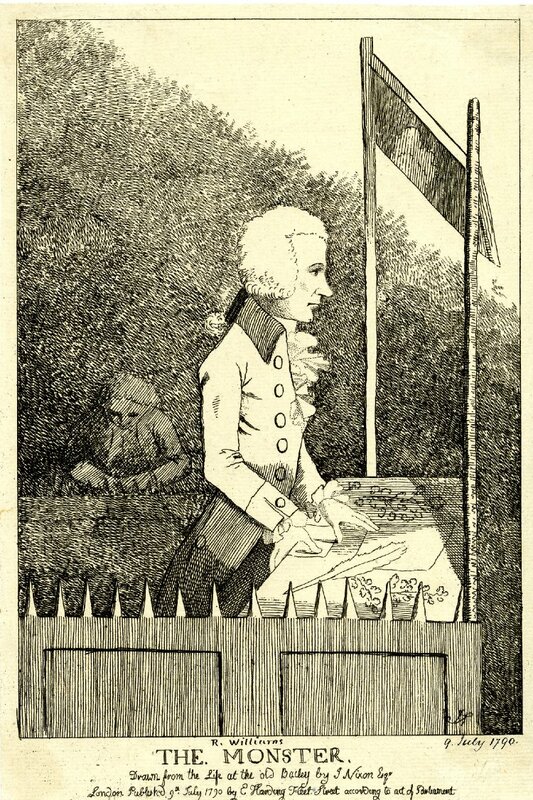 Writing to one of retailers in Manchester in 1776, he explained that he charged one rate to his customers in the North and a second, much higher one to, “our friends in London”. The painting is untitled and the subject was not identified in the auctioneer’s catalogue. However, similarities between this image and an earlier self-portrait of Collier whose authenticity has been verified by both Bonhams and the Rochdale Museum, strongly suggests that it is a picture of Collier himself in middle-age. The soft cap he wears (possibly itself a satirical allusion to Hogarth’s famous Painter and his Pug) is also identical to one that he sports in an engraved self-portrait produced near the end of his life. The significance of this work (and it’s estimated hammer-price) may therefore have been radically understated. It was early one Sunday evening in the middle of May 1788 and Mrs Maria Smyth, the pretty young wife of an eminent physician, was setting out from her home in Stephen Street to visit a friend who lived in Johnson’s Court in the City. The walk was not a particularly long one, but the light was already fading by the time she passed under the arches of Temple Bar and London’s streets were beginning to grow quiet and empty. As she made her way past the shuttered shop fronts of Fleet Street, Maria Smyth began to realise that she was no longer walking alone; a tall thin man, dressed in a shabby but genteel fashion and wearing a rakishly cocked hat, had fallen into step alongside her. The pair walked on in silence for a few moments, until the stranger turned suddenly and in a voice which quavered with a “tremulous eagerness”, propositioned the startled young doctor’s wife in the most lewd and grotesque manner imaginable. Shocked, she said nothing but quickened her pace in the hope of shaking-off the impudent stranger. The man dogged her all the way along Fleet Street, sometimes breaking off his attempts at conversation and dropping back a few steps as if he had lost interest, before suddenly rushing up alongside her with a fresh wave of obscenities and insults. The fortitudinous Mrs Smyth bore this abuse in silence until she reached the entrance to the passageway which led off Fleet Street to Johnson’s Court. At this point she could stand no more and turned sharply on her tormentor, angrily telling him to go about his business and leave her in peace. He made no reply but merely grinned back at her menacingly. Realising now that she was dealing with someone who was not in their right mind, the lady turned and ran hastily down the passageway into the darkened confines of Johnson’s Court and began knocking urgently at the door of her friend’s house. The door was opening for her when the stranger suddenly leapt up on the stairs and lashed out twice, driving a small knife into her left breast and thigh. The force and shock of the attack sent her tumbling forward in a swoon and she collapsed through the doorway and into the arms of the servant who had been about to admit her. Her attacker stood in the doorway looking down at the bloodied body of his victim for a few seconds, before the maid who had answered the door had the presence of mind to slam and bolt it in his face. It later transpired that the heavy stays of Mrs Smyth’s dress had deflected the full force of the blows and she would escape the attack with relatively light physical wounds. The mental scars however took much longer to heal and it appears that Mrs Smyth suffered something akin to a nervous breakdown shortly after the attack. She was to remain confined to her bed for weeks and it was several months before she regained sufficient confidence to venture out onto London’s streets once more. Although no-one knew it at the time, Mrs Smyth had become the first victim of a mysterious piquerist who was to haunt London’s streets for the next three years. He operated in the area around Westminster and St James’s and normally struck at attractive young women as they walked alone. Described by most of the victims as being tall and thin, with a long face and large nose; he had a respectable if somewhat down-at-heel appearance. The victim would normally be accosted out of the blue, roundly abused for several minutes as the attacker apparently worked himself up into a kind of frenzy, before being stabbed or cut in the legs, breast or buttocks. These outrages became more frequent in late 1789 and reached a new peak of intensity in January 1790, with no less than five separate incidents being reported on the evening of the Queen’s birthday celebrations. The most serious of these assaults occurred just after 11pm, when 21 year old Anne Porter, her 18 year old sister and their elderly maid, were returning home after watching the celebration ball at St James’s Palace. A man stopped them as they walked down St James’s Street, swore violently at Anne and then suddenly punched their chaperone in the head. The terrified girls ran to their front door and were still banging at it frantically and calling out to be admitted, when the man appeared behind them and drove a knife deep into Anne’s thigh. The unusual nature of these crimes and the fact that the victims were all defenceless young ladies, eventually prompted the more excitable members of the press to dub the perpetrator “the Monster”. By now it was clear to even the most dunderheaded of magistrates that there was something seriously amiss on London’s streets and as news of the attacks spread, the metropolis was gripped by mass-hysteria. Groups of merchants rushed to subscribe to a fund which could be used to offer a reward for the immediate apprehension of “the INHUMAN MONSTER… who has so frequently wounded several young women.” Others sought to take matters into their own hands and immediately set up local vigilance committees to ensure that their neighbourhoods were adequately patrolled after dark. This resulted in a number of unfortunate incidents of mistaken identity, in which parties of gung-ho vigilantes set about innocent men who had caused some minor disturbance or other following a night of heavy drinking. London’s enterprising criminal classes soon learned to turn this sense of fear and panic to their advantage, with pickpockets sending up a cry of “the Monster!” to make good their escape while their unfortunate victim was left scrambling to escape the clutches of the mob. Cases of mistaken identity such as these were said to have become so common by the spring of 1790 that many young men were afraid to set foot outdoors after dark, without the protection of a female companion to vouch for their character. One group of fashionable young fops, keen to ensure that the crisis did not interfere with their nocturnal dalliances, developed an alternative strategy and formed the No Monsters Club. Members wore large cardboard badges with the words “No Monster” written on them as a means of reassuring the young ladies of the town that they were not knife-wielding maniacs. The press had a field day with the No Monsters, sneering at their less than chivalrous motives and dryly observing that the rules of the club did not actually extend as far as to require any member to participate in the capture of the Monster himself. 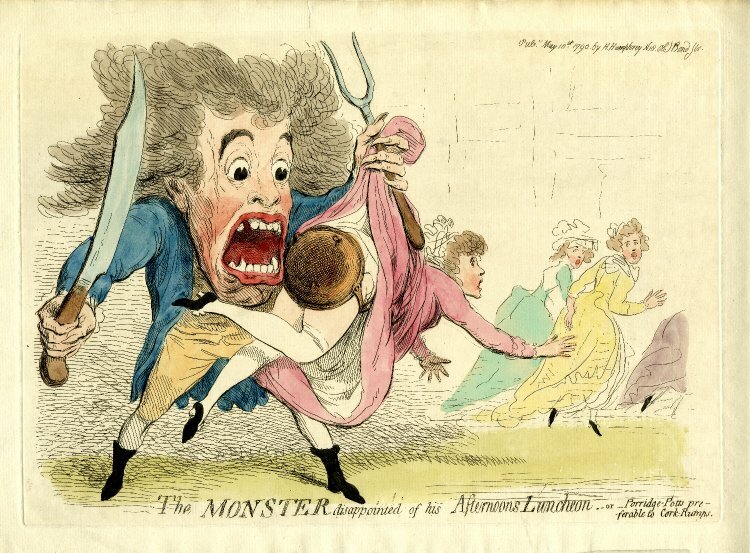 The first caricature on the Monster phenomena was a two panelled affair by Isaac Cruikshank entitled The monster cutting a lady / Copper bottoms to prevent being cut, published by S.W. Fores on 1st May 1790. It straddles the line between news and satire, claiming to be be based upon “a likeness of him [that] was drawn by a lady who he had wounded and approved by two others”. 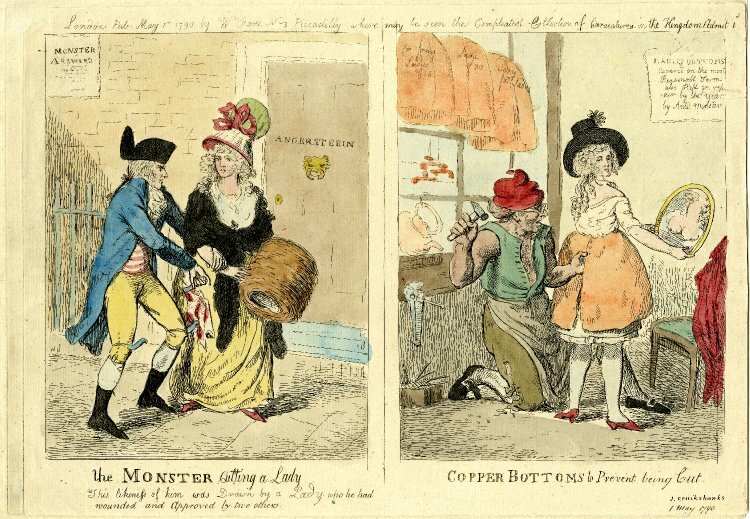 The print shows a serious image of the Monster savaging his victim, alongside a more jovial scene of a young woman being fitted with copper underwear. 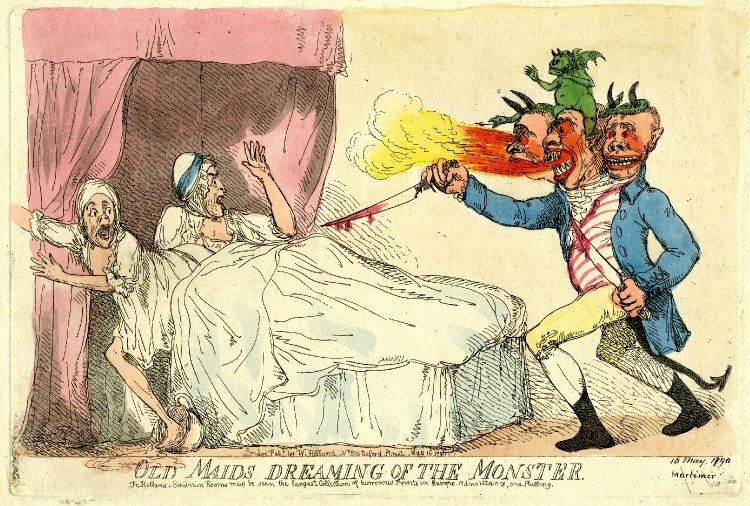 Gillray took the slightly smutty subtext of this second image and ran with it in a print called The monster disappointed of his afternoons luncheon-or porridge-potts preferable to cork-rumps which was published a week later. It presents the monster as a hideous bugaboo, lifting up his victim’s skirts and being outraged to find the lid of a porridge pot has been securely fastened to her rump. Gillray also etched a second much ruder version of the print, in which the pan lid is missing, that was presumably intended to be sold under the counter of Humphrey’s shop. William Holland made his own contribution to London’s Monster-mania six days later, with the publication of Old maids dreaming of the monster. It shows two terrified old dears being roused from their slumber by a hideous three-headed apparition which breathes fire as it lunges for them with a knife. 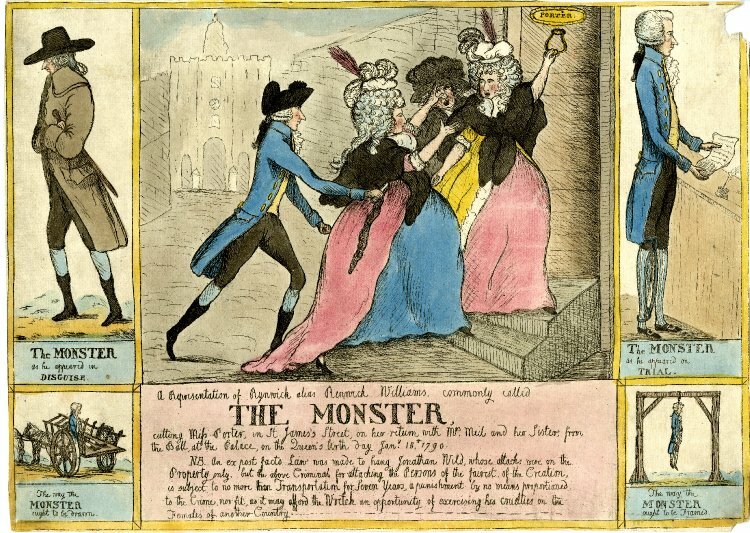 The print is probably a reference to the case of Mrs Mary Fisher, a cook who claimed that the Monster and two accomplices had punched her to the ground and cut her across the face while she was walking through Charing Cross late on the evening of 11th May 1790. Her account was scoffed at by the press, who rather cruelly pointed out that the Monster’s victims were all fashionable young beauties, while Mrs Smith was “very plain, poor, middle-sized… forty, and very meanly dressed.” Some even went so far as to suggest that the incident was a hoax, formulated by a desperate old boot who vainly sought to see her name ranked alongside that of beautiful young debutantes like the Porter sisters. Holland’s print perhaps suggests that an alleged hoaxer like Mrs Fisher would get more than she bargained for if she were unfortunate enough to experience a real encounter with the dreaded Monster. 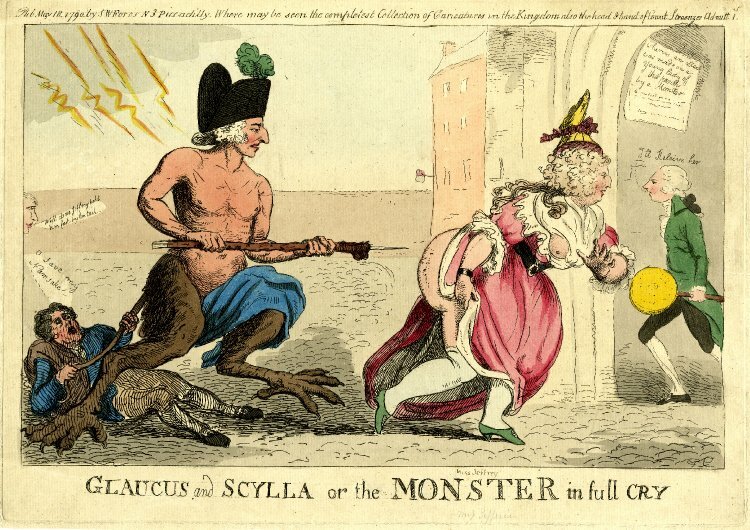 By the 18th of May 1790 caricaturists had begun incorporating the Monster scare into their political satires, with Isaac Cruikshank using it in his Glaucus and Scylla or the monster in full cry to send up the latest gossip surrounding the Prince of Wales and his dissolute circle of hangers-on. The print shows the Prince’s friend Captain George Hanger chasing Ms Elizabeth Jefferies, an aging courtier and maid of Princess Charlotte’s, through the gates of St James’s Palace. Gillray continued the political theme two days later in Swearing to the cutting monster or – a scene in Bow Street, in which he imagines the Whig leader Charles James Fox standing in the dock accused of the Monster’s crimes. 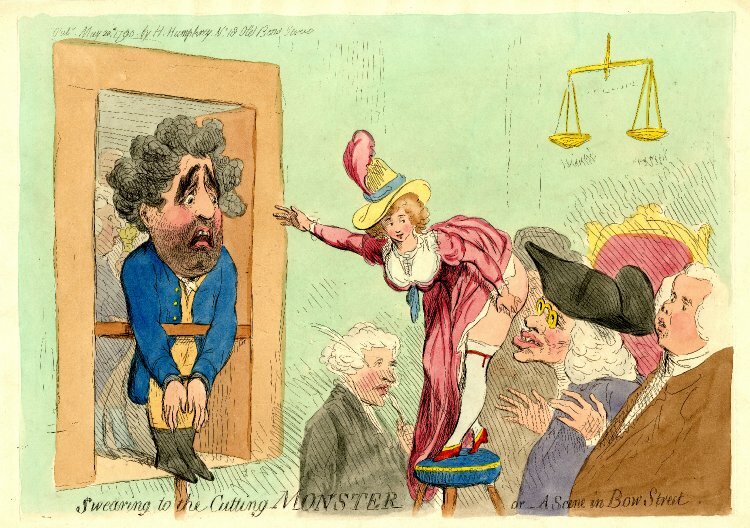 The print lacks satirical punch but remains humorous nonetheless, thanks to Gillray’s depiction of the magistrates, who ignore Fox complete as they stare longingly at the behind of the beautiful young witness. Speculation about the Monster’s identity was brought to an abrupt halt in the second week of June 1790, when it was announced that the Westminster magistrates had arrested a 23 year old artificial flower-maker named Rhynwick Williams and charged him with the crimes. Williams had been identified by Anne Porter, who had come upon him quite by chance while walking in St James’s Park with an admirer. Miss Porter’s gentleman friend then followed Williams around London for some time, before eventually inducing him to return to the Porter family’s home in St James’s Street where he was detained and placed under arrest. Not only was Rhynwick Williams a close match with the physical description of the Monster given by a number of the victims, he also known to be a frequent visitor at local brothels and had already acquired a reputation for pestering respectable young girls with unsolicited offers of marriage. His job was also regarded as suspicious, as the Monster had been known to conceal a large needle among a bunch of artificial flowers and stab his victims in the face when they bent forward to smell the blooms. Williams was initially confined to Clerkenwell Prison, where it was said that even the meanest of his fellow inmates refused to speak to him, while the Westminster magistrates constructed their case against him. It was clear that the public was in no mood to countenance any show of leniency towards the man accused of committing these heinous crimes and a charge of assault was therefore deemed to be insufficiently severe. The authorities then hit on the idea of charging Williams with the destruction of property, namely his victims clothing, under an antiquated statute of 1721. This was a crime which carried a sentence of up to seven years transportation for each offence and would therefore result in Rhynwick Williams being shipped off to Botany Bay for the rest of his days. One of the more thoughtful journalists sent to cover the case wondered whether the magistrates had not done Williams a favour, as a charge of assault would require him to stand in the pillory and in all probability result in him being stoned to death by the mob. The trial took place at the Old Bailey on 8th July amid ugly scenes. The prison van which brought Rhynwick Williams to the courthouse had to battle its way through an angry mob and when the prisoner was finally led into the courtroom the packed public gallery erupted in a cacophony of boos, hisses and shouts. The publicity surrounding the case was such that there was not a man, woman or child in London who had not heard of Williams and was not already utterly convinced of his guilt. The prisoner had even had trouble finding a lawyer willing to represent him and when his council did finally open the case for the defence, he did so by apologising to the female witnesses for asking any questions which appeared to contradict their version of events. Williams protested his innocence throughout and even presented several witnesses who were willing to swear that he had been working until well after midnight on the night that Anne Porter was attacked, but it was no use. The courtroom took on the air of a pantomime, as the witnesses for the defence were booed and hooted continually before being contemptuously dismissed by the judge, while those appearing for the prosecution were applauded. It took the jury just moments to decide that Rhynwick Williams was guilty and the prisoner sat trembling as the presiding judge, struggling to be heard over the cheering spectators, announced that sentencing would be deferred until December so that a council judges could consider the case. The trial prompted the production of at least four more caricatures on the Monster affair. The merchant and amateur caricaturist John Nixon had squeezed himself into the packed gallery of the courtroom and completed a sketch of Rhynwick Williams standing in the dock. This image was then purchased by the engraver Edward Harding of Fleet Street and published on 9th July. The map and printseller John Wallis also published a portrait of Rhynwick Williams which was sold from his shop at 16 Ludgate Street. Dorothy George subsequently attributed the image to Gillray but this seems somewhat speculative, as the print seemingly owes little to Gillray’s artistic style and was produced by a publisher with whom he is not otherwise known to have had any dealings. William Dent, another wealthy merchant who dabbled in satirical art, produced two Monster prints shortly after the trial. A representation of Rynwick alias Renwick Williams, commonly called the Monster offers us some indication of the public mood in the days following the trial. It consists of several panels which show Williams stalking the streets, brutally stabbing Anne Porter and then standing nonchalantly in the dock. The text in the central panel argues that some special measures should be taken to make Williams’ crimes a capital offence. A sentence of seven years transportation, Dent argues, is “a punishment by no means proportioned to the Crime, nor fit, as it may afford the Wretch an opportunity of exercising his cruelties on the Females of another Country.” A suitable alternative is offered in the two final panels which show Williams being paraded through the streets in a tumbrel and then hanged. 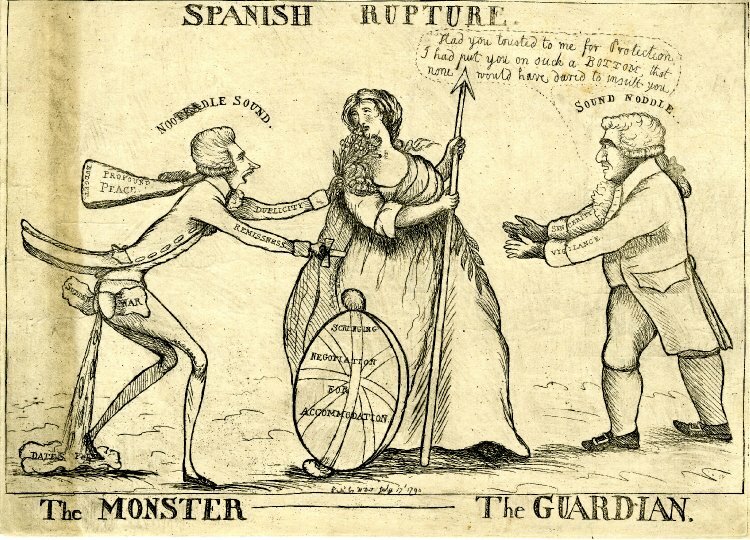 Dent returned to the Monster theme in a political print issued a few days later under the title Spanish Rupture, which shows William Pitt thrusting a bunch of artificial flowers into Britannia’s face as he drives a dagger into her backside. The print was intended as a satire on the government’s handling of the Nootka Sound Crisis and heralded the arrival of a new story which was finally to displace Monster-mania as the chief source of headlines and satirical squibs. When the judges finally met to consider Williams case, they concluded that he could not in fact be charged under the terms of an outdated law relating to the willful damage of clothing and that the verdict against him was therefore null and void. 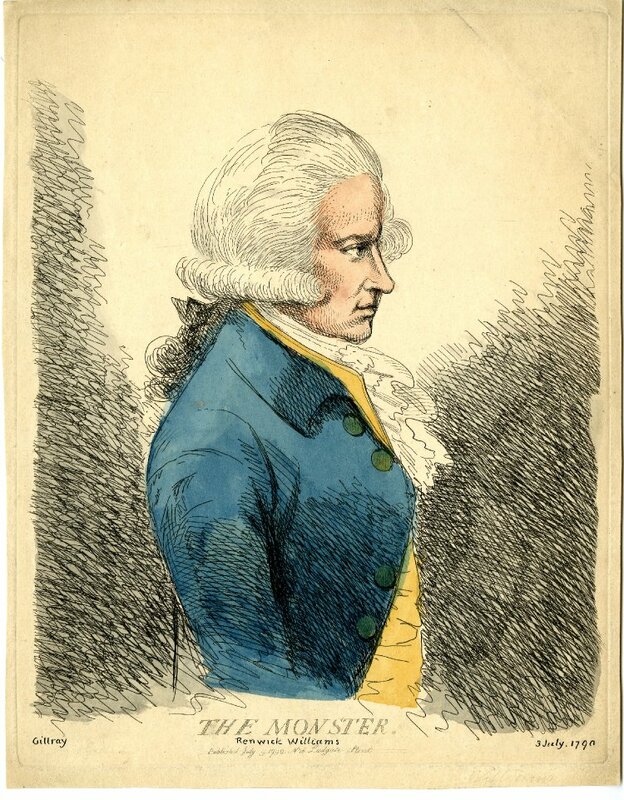 A retrial took place in December 1790, at which Williams once again presented several witnesses who swore that he had been working with them at the time the Monster had made his attack on Anne Porter. It was to no avail though and the defendant was once again found guilty of three counts of wounding and sentenced to six years in jail. Rhynwick Williams continued to maintain that he was innocent of the charges against him and spent his time in prison writing letters and pamphlets which set out the evidence he had presented at the trial. He married shortly after leaving prison in early 1797 but then promptly vanishes from the historical record forever. The historian Jan Boneson, whose book on the Monster remains the most comprehensive account of the case to date, suggests that he probably changed his name in order to leave his unfortunate past behind him. It is a theory which was supported by the presence of a contemporary print in Bondeson’s own collection of Monster memorabilia, which had the following note written on the reverse: “The Monster – Rhenwick alias Henry Williams – An artificial flower maker. 1831.” Bondeson was then able to locate a reference to an artificial flower maker named Henry Williams, a resident of 9 George Street in the Adelphi, in the Westminster Poll Book for 1818. If his theory is correct, it would appear that Williams spent the rest of his days in quiet anonymity, working hard at the craft which had sustained him before he had been swept up by London’s Monster-mania in the summer 1790.